Fluoridex Daily Defense is a professional gel formula toothpaste with maximum strength fluoride that helps prevent hypersensitivitiy in teeth. 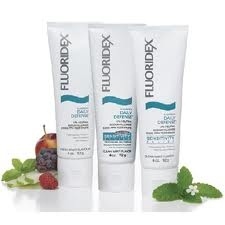 Fluoridex also prevents decay and orthodontic decalcification, when used twice daily just as you would your normal toothpaste. This 4 oz tube comes in Clean Mint Flavor. Peridex reduces bacteria in the mouth. It is an oral rinse used to treat gingivitis (gum disease), a condition in which the gums become red and swollen between dental visits. 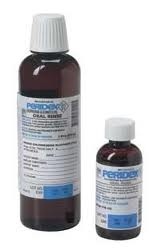 Peridex is also used to control gum bleeding caused by gingivitis. Rotadent® Plus rotary toothbrush is the centerpiece of the Soft Tissue Management® program. When patients brush at home with Rotadent® Plus, they will improve their oral health. The technology behind Rotadent® Plus has been proven to help achieve improved homecare using the same design and performance criteria as the original Rotadent®. This consistent technical design includes the angled brush head design, 360 degree rotating brush head, brush filament fiber material and the three unique brush-head shapes (hollow, short and long).